Mark Bridge’s simple tap-in proved the difference in a tight encounter. Tony Popovic made one change to the side that beat Melbourne Heart last week – after losing Tomi Juric to injury, Brendan Santalab went upfront, Mark Bridge returned to his usual left-sided berth and Shannon Cole switched across to the right. Matthew Špiranović continued at centre-back ahead of Michael Beauchamp. Kevin Muscat was without Kosta Barbarouses and Mark Milligan thanks to international duty, so Connor Pain unsurprisingly started on the left, with Rashid Mahazi handed just a second A-League start alongside Leigh Broxham in central midfield. After a spell of early attacking pressure from either side, this match settled into a cagey, tense tempo. In fact, for long periods this was simply two sides playing in front of each other – it was widely referred to as a “tactical” battle, but it really wasn’t: there were no formation changes, or individual instructions that significantly impacted the pattern of play. Instead, the main feature was the two systems, and how they clashed. The Victory looked to build attacks from the back of defence through the centre, with moves often ending with the wide attackers darting inside into penalty-box positions. True to Ange Postecoglou’s philosophy, their passing is always short and neat, and the midfield duo frequently rank the highest in the league for passes completed – they play an important job in linking the side, and bringing the two advanced playmakers into the game. However, here, the Victory were often forced wide, because of how narrow the Wanderers were defending. At times the home side’s two banks of four was very obvious, and by crowding out the centre with eight players the Wanderers were naturally forcing their opponents towards the flanks – the Victory had to play around them, rather than through them, as is their wont. 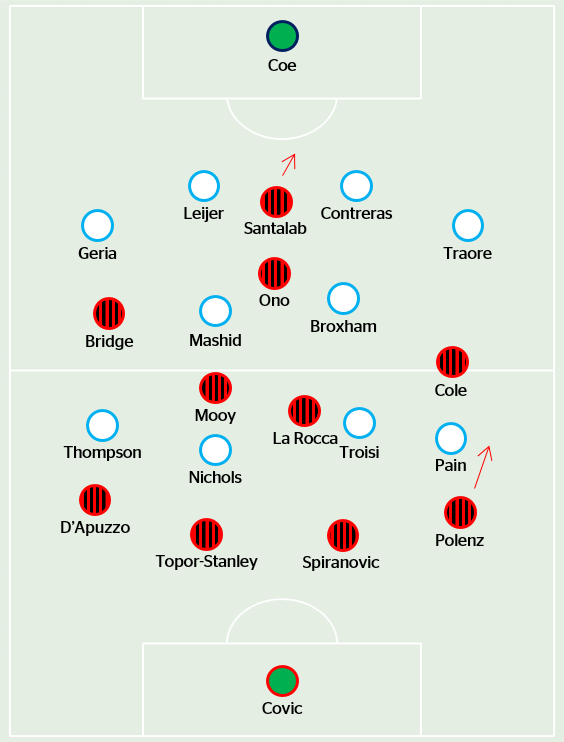 The positioning of the passes received by Archie Thompson and Pain, the attackers who provide the goalscoring threat, is telling – although both players had shooting opportunities in the first half through cutting inside from wide. Often, the Victory had to be very patient in the construction of their passing moves, because of how compact the Wanderers were, and it reinforced the widespread belief that the Victory struggle against set defences. Their best performances this season have all come against teams that play with a high line, like Adelaide, Wellington and Brisbane, and in contrast, their worst against teams that suffocate the space between the lines, like Melbourne Heart in the opening round, and more recently, last week against a ten man Sydney. Meanwhile, a very noticeable feature of the first half was the Wanderers possession – it felt like there was more of an insistence upon control through possession, and unlike what we’ve come to expect from Popovic’s side, there were long spells where they simply held the ball in deep positions. Špiranović finished as their most frequent passer, and the combination between him and centre-back partner Nikolai Topor-Stanley also the most recurrent. Špiranović stepped into midfield on a few occasions to hit two probing diagonals towards the attackers, but that was the exception to the rule – by and large, there was little penetration from deep positions, with the Victory happy to sit off and prevent passes into the midfield duo. Both sides also nearly ran into trouble with their insistence on playing out from the back, with Mitch Nichols at one point catching Topor-Stanley on the ball and at the other end, Santalab forcing Adrian Leijer into a terribly rushed clearance. When the Wanderers managed to find Aaron Mooy in midfield, though, it turned into a very promising avenue for attacks, because Mooy’s distribution was always intelligent and very positive– he spread play calmly towards the right flank to switch the point of attacks and free up Cole in space. With Polenz overlapping typically, the majority of Wanderers moves stemmed from this side. However, Cole’s crosses (often lofted towards the back post) were always slightly overhit, while Polenz tended to cut back onto his left foot and curl them into a similar zone – but aside from one which fell to Santalab in the penalty area, the success of the crosses was limited. In that sense, t’s fair to say Tomi Juric was missed. However, the overriding theme was that both sides were inherently more comfortable when they could attack quickly. At the tail end of the first half, the best chance for either side came in quick succession, both from moves of four rapid passes from one end of the field to the other. First, Cole found himself in space down the right and he crossed for Santalab when he might have been better shooting. Immediately after that, the Victory counter-attacked, and Thompson dragged his shot just wide. The Wanderers in particular looked more promising when they bypassed the midfield zone altogether, or launched counter-attacks with long balls over the top. Early on Shinji Ono fed Santalab over the top, then later Cole found himself in space thanks to another Ono through-ball. Nine minutes into the second half, Jerome Polenz simply hit a ball down the line, but Santalab latched onto it to force a good save from Nathan Coe. Santalab rarely linked up with his teammates, but instead played off the shoulder and sprinted onto balls in behind. Even when Santalab was substituted, his replacement, Labinot Haliti, replicated his role, and the game’s only goal came when Haliti held up a long ball in the channels and teed up across goal for a simple tap-in. Although there was still time for the Victory to try for an equaliser, very little of note occurred in the final few minutes, although the introduction of Scott Galloway seemed to signify a formation change towards an attacking 3-3-4 – but it had little impact. Although the goal was created by a substitute, the changes from the bench weren’t particularly inspired, and were essentially a series of like-for-like changes. That underlined the close nature of the contest, and Muscat will feel aggrieved that it only took one mistake for his side to not even come away with a draw. It’s a testament, though to the quality of the top sides that these sort of games are being decided by those type of margins – it emphasises the growth made by the league’s top tier of teams.